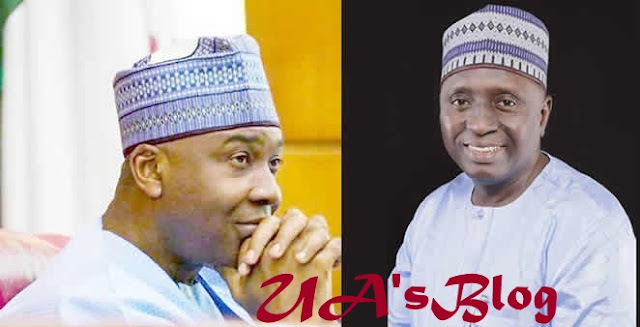 Senate President Bukola Saraki is not returning to the upper legislative chamber having lost his reelection bid to Ibrahim Oloriegbe of the All Progressives Congress (APC). While Oloriegbe polled a total of 123,808, Saraki who contested under the platform of the Peoples Democratic Party (PDP), trailed with 68,994 votes, leaving a margin of 54,814 votes. The results were announced at the collation center of the senatorial district in Ilorin, the state capital. Saraki lost all the four local government areas in the senatorial district. In Ilorin south, Oloriegbe had 26,331 while Saraki secured 13,013 votes. In Ilorin east, Oloriegbe polled 30,014 votes while Saraki got 14,654. In Asa, Oloriegbe polled 15,932 while Saraki got 11,252 votes. In Ilorin west, his local government, Oloriegbe, garnered 51,531 votes ahead of Saraki who had 30,075 votes. Like Saraki, Oloriegbe is a medical doctor. He was a member of the state assembly between 1999 and 2003. In 2011, when Saraki first contested the senatorial election, he defeated Oloriegbe who ran on the platform of the then Action Congress of Nigeria (ACN). Saraki was a member of the APC until the crisis between the executive and legislature made him return to the PDP where he spent his two terms as governor of Kwara. He was among the aggrieved PDP members who formed nPDP and teamed up with the APC to win the 2015 general election. He sought the presidential ticket of the PDP but lost to Atiku Abubakar who later appointed him the director-general of his campaign. It was a double loss for Saraki in this election as he could not also deliver Kwara for Atiku. The O’ to’ge movement led by Lai Mohammed, minister of information, played a key role in the loss of the senate president.